The scheme will offer 25 hours of free childcare from next month. MINISTER FOR CHILDREN Katherine Zappone today announced a new childcare scheme for children. The scheme will offer 25 hours of free childcare a week to homeless children under 5 years of age. The scheme will be rolled out in January, starting in Dublin (because the homeless crisis is most acute there, says the Minister) and gradually being offered in other areas. The childcare facilities will be offered a flat rate of €110 per week per child, which includes the care itself, plus a meal. The scheme will cost an estimated €8.25 million, and the department has identified at least 850 children in Dublin who could avail of this scheme. The scheme will not apply to those at risk of homelessness. 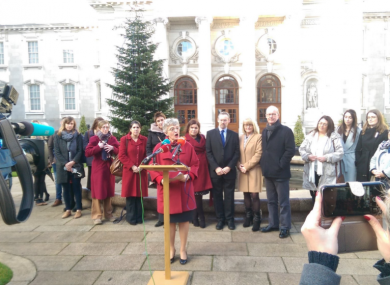 Speaking at a launch today, Zappone said that the scheme “will lift a huge burden from families”. “This is an important initiative targeting a particularly vulnerable group of children who need additional supports given their situation. Focus Ireland’s Catherine Maher said that this scheme was identified as necessary from speaking to parents. They had to drop their older children to school, and meet with various organisations to try to find accommodation. Often, they would have to bring their young child with them, “dragging them from one place to another”. The Children’s Rights Alliance welcomed the announcement, saying that a lot of homeless children “do not have access to play facilities and are unable to develop at a basic level”. This will help to address the current situation where families living in hotel rooms cannot store or cook their own food, which is also negatively impacting on children’s health. According to government figures, 85% of homeless children are located in the Dublin region. Email “Homeless families can now get 25 hours of free childcare”. Feedback on “Homeless families can now get 25 hours of free childcare”.